My awakening to what I’m called to do began in 2017. It was a regular coaching call with my business coach, Julie Foucht. I hopped up on my soapbox, passionately lamenting about how the 2017 Women’s March brought out hundreds of thousands of women all over the world to be visible and protest – successful, powerful, bringing so much hope to so many people. But then, I asked, what happened? It seemed like, as fast as all that power and energy blasted into our consciousness, just as quickly it retreated back into the shadows. Either we were afraid of our own success or we did not have the vision to take it to the next step. Whichever the reason, it felt to me like the opportunity to galvanize real change just slipped right through our fingers. Think of Dr. Martin Luther King and the Civil Rights Movement. Where would it be today if Dr. King had not stood up to be visible in his speeches and in leading marches, with conviction and persistence? Interesting that today there are new movements in the civil rights arena – Black Lives Matter and Teach Us All, to note just two – that are actively educating us all on the fallacy that civil rights ended racial discrimination. In fact, their lives may be even more segregated today than they were in the early 20th century. Will they be flash-in-the-pan movements, or will they create real change? Change takes time. Progress needs constant attention. Movements need leadership. At this year’s Golden Globe Awards, actors in attendance showed their support for the “Silence Breakers,” TIME Magazine’s group designation for Person of the Year. These were women, not just actors but also the founders of the Women’s March, #metoo and others, who bravely stepped up to share their stories of sexual abuse by the powerful in Hollywood and elsewhere. As I’m sure you’ve seen, the women at the Globes showed their support by wearing black dresses; the men were also in black and wearing buttons that read “Time’s Up.” The speech Oprah Winfrey gave as she accepted the Cecil B. DeMille Award (first African-American woman to receive this award) was an impassioned call to action to fight against abuse, sexual assault and any injustices to women. Sexual assault doesn’t happen only in Hollywood and Washington, D.C. It is a silent epidemic that revolves around the powerful, whether by rank, position, or gender (by the way, it is not just one gender that I’m talking about here). Believe me, I saw – and experienced – it all during my military years as a female moving through the officer ranks in the U.S. Army. Here’s the exciting news: There are movements popping up all around us. From fighting for equal education for all students, to rescuing race horses and greyhounds off the track before they are murdered, to breakfast programs in elementary schools, to sheltering the homeless, to renovating appalling living conditions in our jails and prisons – to more than I can possibly list here. All important, all worthy! How about you? Is there a movement that has stirred you with hope and excitement? Or perhaps a cause where you want to see change happen, or injustice that you want to see corrected? Have you felt that you’ve stayed in the shadows, or just haven’t found the movement that speaks to you? Maybe you’ve thought of starting your own? Tell us about it in the comments below. 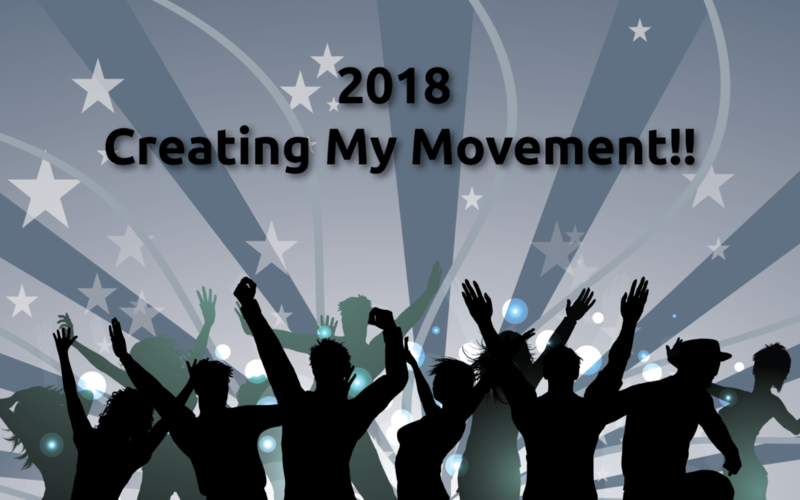 Here is what has awakened me to take action: This is the year to Create Your Movement! As we heard during the Golden Globe event and across social media, #TimesUp. No more talking, let’s start doing! If you have ever thought you wanted to step out of the shadows, make yourself visible and stand up for the change you want to see, the time is now. You have the passion, you have the beginning of a vision. Let’s do this work together. My passion is to bring my many decades of leadership experience to help women make change through making movements. It’s been calling to me for awhile now, and this is my year to Create a Movement. So let’s get together. Connect with me to talk about what movement you would like to join or, better yet, start.